Lazarus – Construct a kit to represent a close ancestor, wow! Yes I have used Lazarus to construct a kit for my mother from me, my brother and her two sisters but I have not experimented enough with it to report yet. Soon. I have not tried the relationship tree tool yet either. Later. The colors in the graphic section just indicate where the logical breaks are in the overlaps, they are not otherwise significant. The names and kit numbers have been deliberately obscured for privacy. The Triangulation tool is the one that excites me the most. The concept is to show where you have two or more people who match each other at the same location as you match each of them. A three-way (or more) match means that all of you share a common ancestor from whom you got that DNA segment. As you can imagine, this takes a while for the computer to crunch its way through. The first section with the graphic does not show the names or email addresses for the matching kits. The next section, without the graphic, is sorted by kit number and it does give you all that information. I just erased a bit of it from the image for privacy. You can select either or both these outputs from the form. I prefer to use the second one, the Triangulated results sorted by Kit Number, etc and then I cut and paste those results to a spreadsheet. Next I make a copy of that spreadsheet sorted by chromosome and start position which shows me the triangulation information that I was looking for. I can use these results with my Segment Mapper or One Chromosome Mapper to make a picture. I am working my way through this and emailing new DNA relatives. More posts on Tier 1 soon. ← Free transfer of DNA data from Ancestry to Family Tree DNA! A very good point Jim, thanks! Lisa – IBS is Identical By State, the term used when we are not sure if it is from a common ancestor. I have been trying to contact a Kitty Cooper in regards to a match between myself,A304581 and Kittys Aunt M175723. Great thanks! Looking forward to a more in depth blog on these new tools I feel like I’m getting no where. So what exactly does this mean? I’m a little lost. So let’s say I dna test with you. What does it tell me? Will it give me beyond the 14th cousin nonsense I can’t make heads or tails of, I get on the other sites? I am looking for my adopted sisters birth parents. I have gotten no where in the three years I have poured my time and energy in finding someone to leader me in the right direction. Please go to http://DNAadoption.com and read their methodology. Join their mailing list at yahoo. There are people there who can help you. Kitty! I am just trying to figure out what my country of origin is and maybe if I have caribbean decent. How do I do this??? I’ve taken Ancestrydna and FTDNA and also have the tier 1 version of GedMatch! Any help would be appreciated! Louis – The ancestry composition tools at the various sites are in their infancy and not as accurate as they may be some day. Look through my slide show section on the admix tools at GEDmatch: http://slides.com/kittycooper/gedmatch#/5 and there is a handout in my downloads section that goes with it. 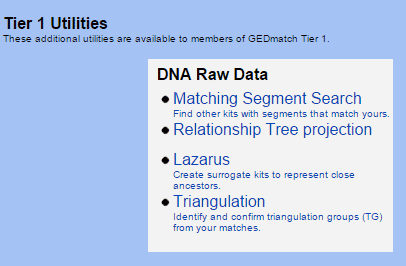 I have a Gedmatch account, but I don’t see these Tier 1 offerings. How do I sign up for them? Another blog said that a $10 donation gets you these tools. I see the donation button, but not anything about Tier 1 tools. Thanks for introducing these tools! If you donate the $10 it is only for a month. Does it allow you to see different uploaded if you are the one supporting those tests or do you pay for each kit you support? I am researcher for 5 different people. 4 lus me. have not read any of your stuff yet. just looking to see what you have. sounded like you have simple instruction on how to use Gedmatch tools. i just paid for another test wish I had looked at your site before I did it. I have lots of posts about GEDmatch (click the tag n the cloud on the right) and a manual in my downloads area. Ancestry, due to their great advertising and large genealogy customer base, has a way larger DNA database. Besides, I love the genealogy programs they sponsor on PBS. I donated three days ago, but see nothing on Tier 1 access. Does it take longer or should I email them? Thank you mskitty. I doubled checked and realized that I didn’t hit the donate tool. Very simple and now I have Tier 1 benefits. the $10 donation is for use of the tools for 1 month only? So if I need to use them for a time period longer than that I will need to donate another $10 for another month? Say I sign up for for the Tier 1 Tools, is my card charged until I cancel it or is this a 1 time charge that you renew every month? I just donated, and there is an option for a one-time donation (for a month of access) or for recurring donations. I’m confused over the difference between the Segment Matching Tool and the “People who match one or both of 2 kits” using the chromosome browser. Can you explain why the SMT would be different? Thank you! The segment matching tool shows the actual segments where your kit matches specific kits which is invaluable for figuring out which line someone is elated on or ancestor gave you which piece of DNA. Of course the triangulation tool is even better. I have been searching for my biological father for 40 years. I have tested with Ancestry, 23andme, and uploaded my results to ftdna. I found gedcom and have been trying to learn as much as possible about it but I am completely confused about how to best use the site. When I look all I see is my FTDNA results listed. How do I use any of this information to differentiate between my mothers side and my father’s side. I have my mother’s tree back to 11 generations. I am female and have had heard that finding dna specific to my father is impossible and will never happen. I’ve spent close to ten grand hiring people, joining sites, testing many different people. I’m beginning to believe they are right. Would you know of a person or a site that can take all this information and make sense of it? Ancestry Pros failed after 2500.00 spent. I can no longer spend hundreds of dollars looking and I’m not getting any younger. This is a very new field and we are all still learning. DNAADOPTION.com has had some remarkable successes and there are search angels there who will help for free. Also DNA detectives on Facebook. Have you tested your mother or maternal relatives to help separate out your Dad’s DNA? I just got done donating but for some reason I used the wrong email and donated 10 dollars with it reoccurring every month. I emailed them and gave them all the correct information such as my account email and such. Should I be worried or will it get fixed pretty quickly. So, if I were looking to confirm a grandfather’s identity, then I would raise this to…??? I do not follow your question. Why not use a one to one compare for the suspected grandparent? Or use the compare a group with the chromosome browser to compare him to your immediate family? What do you want to accomplish with the triangulation tool? Please. Is there a tortial that states this is what, this is how, this is where you gather the info, this is how you gather your info. I have purchased the Tier 1 monthly donation. I have sought for months to understand Gedmatch matching thru the FREE arena, but with only mass confusion. I now move to the PAID tier. WHERE DO I GET TUTORIAL WITHOUT ALL THE SELLING OF TIER 1 ? i’m here in the DONATION side. I’m in. HELP ME TO MOVE FORWARD. GEDmatch is a set of tools for the geeky genetic genealogist. It sounds like your confusion comes from expecting GEDmatch to do the work for you like ancestry does. In practice, you use the tools there to look at your DNA and your matches according to your own goals. There is a basics manual here in my downloads section. Needs updating but has the general idea of what you might do there. The original discusses ancestry composition and some basics. A summary of hat I said with the slides is in my downloads area. Spreadsheet? I have Microsoft Excel. I do not know the cell factors to enter. where do i collect the cell factor information? Use DNAgedcom.com to download a spreadsheet of your match data if you tested at family tree DNA or 23andme. If you tested at ancestry then upload to family tree DNA for $39 and then download the spreadsheet of your matches. Click on DNA spreadsheets on the right to look at various articles on using them. You might also try genomemate, a program that organizes this information for you. You do not need to be the administrator of your Dad’s account to look at his data. But if you wish to be, do you have the email address it was registered under? You can send a password reset to that address. It used to be that the autosomal and X were separate uploads. So if he never uploaded his X you might get that problem. Have you run the “DNA File Diagnostic Utility” to check? You will need to select the Build 36 Raw Data Concatenated file at family tree DNA if you wish to upload his data again. Why do I have 5 kit numbers and my brother only has one on GedMatch? I had to try several times for mine to upload. We both tested at 2 sites and then uploaded to GedMatch. It sounds like you managed to upload more than one kit. I always read the comments, as there are often questions answered that I have as well. No question this time, just wanted to say how incredibly patient you are with all us “DNA Dummies”. Most of what I have learned in the past year has been from experts like yourself who are very generous with their knowledge. Thank you! Unfortunately, none of the tools on gedmatch (any tier) are very good. Rock, I considered deleting your comment since it seemed designed to get a link to your document or perhaps start an argument. It contained no useful criticisms and while GEDmatch may not be useful to you, it is extremely useful to others. Since I do love DNAgedcom.com as well as GEDmatch and found your document useful, if family tree DNA-centric, I left your comment. The problem with family tree DNA is that you cannot directly compare your matches to each other so unless you have multiple family members tested there you cannot do true triangulation. The ADSA utility at DNAgedcom is a good visualization and approximation for those without endogamous ancestors but it is useless for those of us with Ashkenazi as we all match each other and have far too many matches. 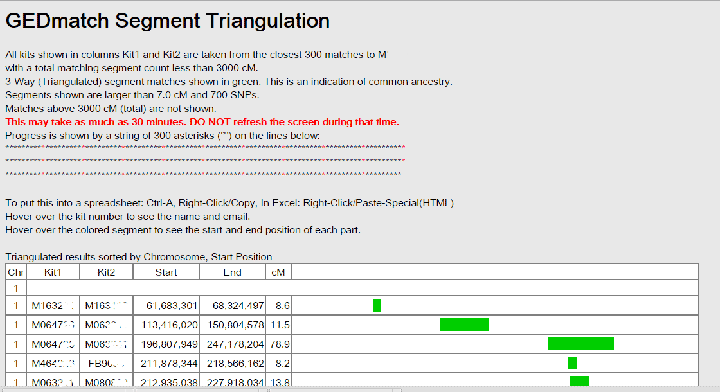 GEDmatch lets us directly compare our matches to each other thus providing a mechanism for confirming triangulation even without that tier 1 utility. In my opinion, GEDmatch has far more tools of interest for genealogists but DNAgedcom is an essential site as well with its ability to download matches from all sites. If you click on GEDmatch, you will find many more articles about that site here. I love the statement “Each company has an algorithm for estimating how closely you might be related to a match. Unless you are a very close match to someone, those estimates are usually way off. Pay no attention to them. ” SO TRUE after 3rd cousins it just cannot be predicted accurately. There is nothing easy about GEDmatch. Lots to understand before it is useful to you. There much help on Facebook and on various mailing lists, try the DNA NEWBIE yahoo mailing list. Also there is the GEDmatch.com User Group at Facebook for GEDMatch specific questions and the Ancestry-GEDmatch-FTDNA-23andMe-Genealogy-DNA group for general help. Always read past posts and files before jumping in. If you want to hire me for some coaching, that is another possibility, see my consulting page at http://blog.kittycooper.com/about-me/consulting/ – I prefer to teach people how rather than do the work for them. Thank you for posting this information. I just did the Gedmatch Triangulation and I am so lost. I am trying to find the identity of my mothers birth father or anyone who is related to her. She is now 77 and time is running out. I have spent hours and hours trying to figure this out. My grandmother (her mother) never had anymore children and so went can’t even test anyone else, except me, which we have done. I contacted Ancestry genealogists and $3,500 as a retainer is ridiculous. If you can please help and point me in the right direction or give me any advice, I would appreciate it. Thank you so much. First off my parents are not related to each other. I have a female first cousin once removed and myself that has our DNA data on this site. This female relative is from my father’s side. But I have since found out she also has connections to 2 different lines from my mother’s sides. I am trying to find any info on my father’s side since my 3rd great grandfather is unknown. What I would like to know is if I was to get the Tier 1 if that would help me more on finding the info I am needing to find for my father’s side? Including myself 6 have shown up for that side. I emailed them and asked for info along if I could access to their matches. They did not reply. I do have access to 2 of those relatives matches. A 3rd grandparent is just at the limit of where you get good DNA matches​. Testing people in your parents generation would be more help. There is only relative left of my parents generation and he doesn’t know about this issue of the 3rd great grandparent being an unknown. Plus he is almost 90 years old and doesn’t live close to me. I forgot to mention the 3 of us have connections to those 2 sides of my mother’s lines as well. As I had mentioned I’m not very close to my family. And at $230 each is a but pricey for the Y-DNA test. So far I have found all of my lines are all connected that I have access to. Even from my mother’s 2 sides they also link together. Plus I’m not very close to many of my family members. So I’ve been discovering the hard way I can’t take all matches of matches for granted (ie in people who match one or both of 2 kits). So I’ve just gone into the triangulation utility but can’t figure out if the green stripe for 2 people means those 2 people plus me? Or just those 2 people? The benefit of paying the extra $10 is getting access to the additional tools called Tier 1. Personally I find the matching segment search and triangulation very useful plus I love the supercharged one to many. I am posting an issue of mine, to get an expert opinion (analysis) from someone in the group who maybe an expert on small segments. I’ve read there is a lot of debate on the topic and is usually negative. I’ve read ISOGG and Blaine Bettinger’s blog. There is an issue, where a surname line came from the same small town as my same surname line came from. I really believe we were related as 4th to 5th cousins. Ancestry match results, bottom’s out at 6 cM. With the background on my line, some of the matches with my surname, I would say the cM’s shared were really low in that my grandfather and my great-great grandfather did not pass much shared DNA down to me according to a chart, ‘DNA Detectives Autosomal Statistics Chart’ and other online statistics charts. I was wondering to myself, how would I match to 4th to 5th cousins, or have the same common 4x great grandparents. So I uploaded the results to GedMatch which you can lower the Centimorgans to 3. I compared myself to the other line with start to end as follows: 23,278,836 to 28,530,339, 4.5 cM, 900 SNPs on Chr.5 and 27,093,528 to 47,702,256, 5.0 cM, 1,220 SNPs on Chr. 16. I compared myself to the other line’s Aunt with start to end: 23,568,400 to 28,355,305, 4.2 cM, 823 SNPs on Chr. 5 and 27,273,899 to 47,576,695, 4.4 cM, 1,126 SNP’s on Chr.16. All three of us have common, somewhat overlapping segments on Chr. 5 and 16 with somewhat strong SNP’s, with at least 4 cM, not 3cM’s. Even my niece’s less than 4 cM’s results, hung in there with Chr.16 with rather large SNP’s. In some study on small segments that quote, “When utilizing small segments, I generally don’t drop the SNP threshold below 500”. SNPs are larger than 500. My ancestor did change his first name when he came to America on the boat, but there are documents such as parish/church records from here and in Germany. Why he changed his name, not sure why, but it could be a confirmation name, which are not documented in parish records in Germany. Would you think that my line and the other line with the same surname are related (Identical by Descent)? yes your 4cM matches which are triangulating could be relevant but they could also be from much further back and be “population specific.” So no they do not prove this ancestry but are highly suggestive that you are on the right track. Are there Y lineages for this relationship that can be tested? Y reaches that far back while autosomal gets more and more random past 3rd cousins. How do I see all 34K of my matches? Relationship Tree projection has variables I,J,A and X with values for each person in the tree. I kinda have a idea what A and X represent but what do I and J mean and how do I apply them to my tree? That is a Beta thing and not one I use. Send your question to gedmatch at gmail and when you get an answer please post it here for all of us. That is a really interesting idea but no, so far not so. I have a question about triangulation. I enter my kit number and then another kit I am interested in, and then the triangulation results show every that is related to both?